What is the Japanese Soaking Bathtub? Where it comes from? What are the health benefits? No one has perfected the art of bathing like the Japanese. This centuries’ old tradition has acquired its own unique position in the daily life of the Japanese, as an act of pleasure with its own etiquette and rituals. Bathing can be found in the most ancient of Japanese myths. Legend suggests it was a ritual purification after labor, first mentioned as an act of the gods during and immediately after they had worked to create the universe. As time moved on, visitors to Japan began to document the locals’ unique bathing practices. A millennium ago the Chinese noted how much the Japanese loved to soak in hot mineral springs, a habit virtually unheard in many other parts of the world. In the 1700s, European missionaries visiting Japan also remarked on their passion for ritual purification and personal cleanliness. This love of bathing no doubt developed due to Japan’s abundant supply of natural geothermal hot water, ready supplies of which are found throughout the Japanese islands to soothe tired muscles and refresh the spirits. As such bathing soon became much more than a rejuvenation. Communal style bathhouses and hot springs provided many social benefits, acting as meeting places where friends would gather to chat, gossip and share views and news whilst enjoying the relaxing hot water. Today natural hot springs, called onsens continue to promote the hedonistic nature of ritual bathing. These range from simple hot pools to tourist resorts where entire towns are devoted to the pleasures of communal bathing. Bathing was and is still regarded by many as a great occasion to get together, where you can enjoy a long hot soak at the local bathhouse with friends. In fact, traditionally Japanese did not have private baths at home and it is only last century that this changed. Not surprisingly bathing in the modern Japanese home is still focused on relaxing pleasure and rejuvenation. And the ritual is always the same. You first disrobe, then enter the bathroom where you wash thoroughly before entering the tub. Only when you are completely clean, and all soapy water rinsed away, do you step into the tub. The water must be as hot as is bearable, and the bather will immerse him or herself up to the neck for a long hot soak. This unique understanding of the pleasures of bathing, and its ability to relax, refresh and rejuvenate lies at the heart of Aquatica’s wonderful range of Ofuro tubs. 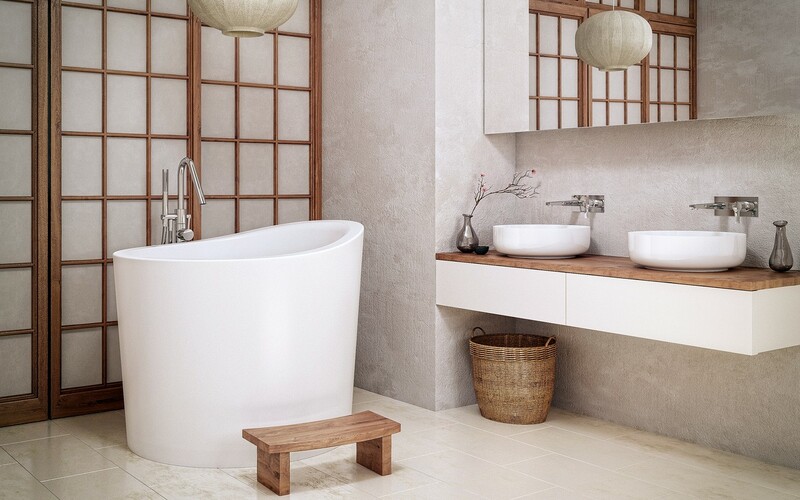 These bathtubs take all the very best ingredients of Japanese style bathing to create a modern-day sanctuary in which to replenish the body and the soul. 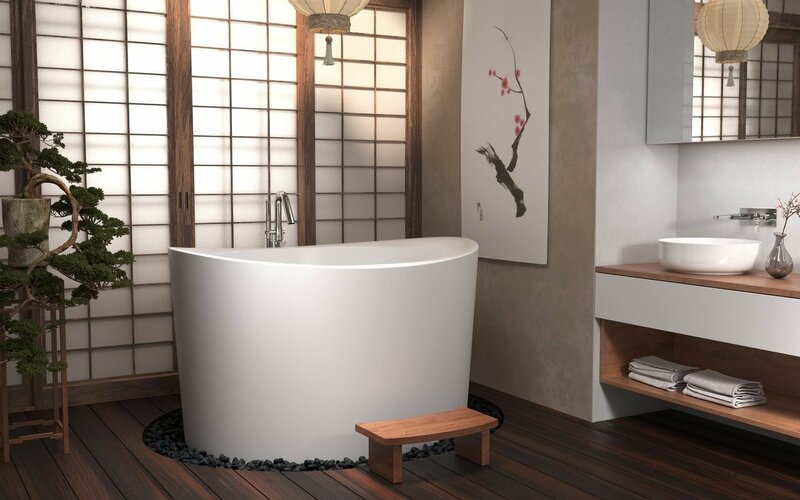 As such they draw unashamedly on the best principles of Japanese tub design and concept. The shape of both the True Ofuro and the Ofuro Mini is very evocative of their inspiration. The depth and the built-in seat of the tub allow the bather to enjoy a seated full body soak in utmost comfort. The addition of the Tranquility heating system means the bather can enjoy constant hot water for as long as they want, without drawing any water from the hot water cylinder. Instead, the system first heats then maintains the temperature of the water in the tub at a constant 40oC, which can be controlled by the fingertip digital control pad. The fact that it is incredibly quiet means your relaxation will not be disturbed. The Ozone disinfection system ensures clean water hygiene. A number of delightful accessories also reflective of their Japanese origins include the teak wood shelf which sits snugly on the end of the bath for those bathing essentials and the optional teak wood step/stool which would have been found in the Japanese bathhouse. Why choose an Acrylic Bathtub?